Things have been a little quieter lately on the Mom Endeavors’ front. I had been so good about posting almost every day! In fact, October yielded my highest views to date. And, then, a funny thing happened. Toward the end of November, I became EXHAUSTED!! And, I was crabby, and moody, and didn’t feel like doing much of anything–not even typing on the computer. In December, with Christmas coming, there were almost no cute crafts or baking done. What did get done was about all I could muster, as there was this added issue–nausea, especially in the evenings when I would get most of my stuff done! 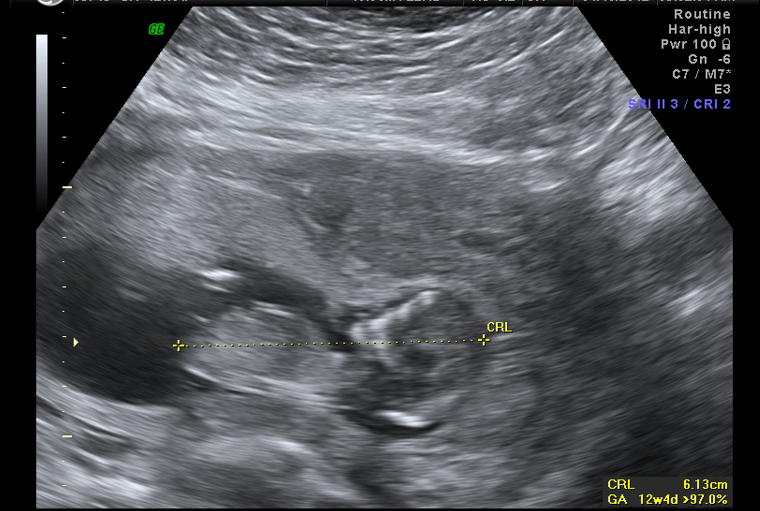 I’m thrilled to share with you that we are expecting baby #3 toward the end of July! 🙂 So, if you’ve noticed a bit of an absence from social media, the blog not being quite up to par, or being a bit slower with my replies to emails and comments, that’s why! But, I’m right about 13 weeks and I think, knock on wood, I am starting to feel a bit better–or at least have a few days where I can manage to accomplish something! 🙂 And, so far, all looks good with baby. 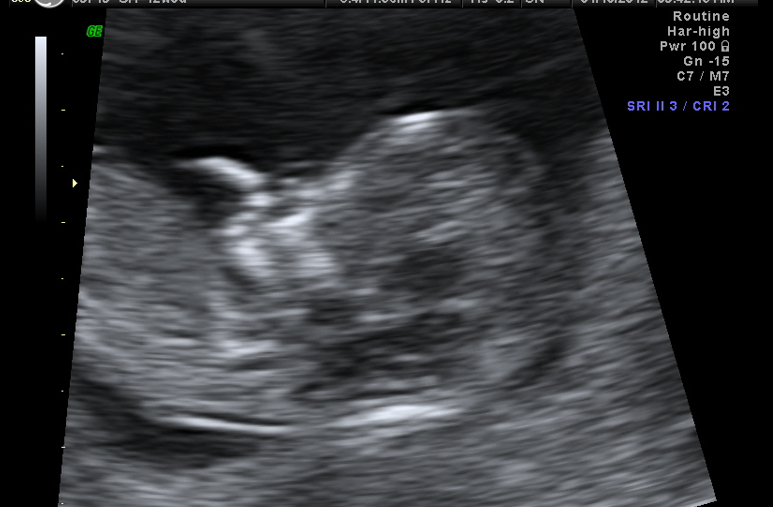 Here’s his or her cute little profile! So, that’s the BIG announcement! « “Guac Off” Recipe Contest! Lots, and lots, and lots, and lots of water! Congratulations!!!! That is very exciting! That’s exciting, and def. a good excuse to be away from the blog! Congrats! Congrats! That’s awesome! I delivered my second in July here in AZ and I pretty much didn’t leave the house the last six weeks. I had a comfy, breezy dress that I practically lived in, which in the heat was a necessity. Congratulations Sarah. Very exciting news. I hope you feel better soon. Wow, Jessica has another baby to meet next December. Take care!! Wow -congratulations! Air conditioning, air conditioning, air conditioning! Congratulations again! I’d say find a swimming pool and live in it during those summer months. It’ll be so worth it! cograts Sara! Take the kids to the pool ALOT. Stock up on summer dresses and skirts. I delivered in September so I was really pregnant for the summer. Phoenix heat and preggers is manageable. Lots of indoor activities. Yay!! Congratulations again!! So excited for you!!! Congratulations! What a gift. May the rest of your pregnancy and birth be healthy (and fun). CONGRATULATIONS 🙂 I bet #1 and #2 are thrilled. Living in IA I have vacationed in AZ in August, Beastly HOT. Try to stay cool, Good suggestions already given, Do not forget to hydrate. Hugs…. Congratulations! Wish I had some great advice for you but it’s gonna be a hot July for you! Try to watch your salt and drink enough water so you hydrate and you don’t get swollen. So excited for you, Sara!! Congratulations! Aww – congrats, Sara!!! How fantastic – sending you a big hug! Oh how exciting!!!! Congrats to you, Mr.Momendeavors, and now both big brothers!! I remember last summer at your house during the Elmers craft night talking about if you had #3 what you would call him or her on the blog. Can’t wait to see what baby #3 is and what you come up with for his/her blog name. And tips… stay indoors… haha. Congratulations! I can’t imagine being preggers in PHX! I grew up there and I cannot stand the heat when I visit. Yup, it’s a dry heat but when you go from FREEZING cold A/C out into massive HEAT (cars are the worst!) I get an instant headache. It’s as if my brain swells. Much of my family still lives there, but I haven’t been in over 2 years and have no plans to visit soon. Of course it’s not bad in the winter. I am so happy for you!! That profile is super cute!! Congrats! We are expecting number 3 too. Due date is end of September. Things sure do pop a lot faster this time around now, don’t they?!? I am 10 weeks on Monday and very much noticeably pregnant! 🙂 I love it! !